Pinto beans, Phaseolus vulgaris, are the most often used type of beans in Mexican dishes. 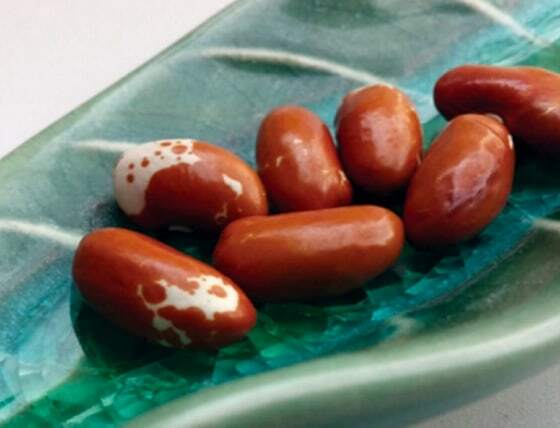 These beans are oval in shape and are normally medium sized with dark spots. 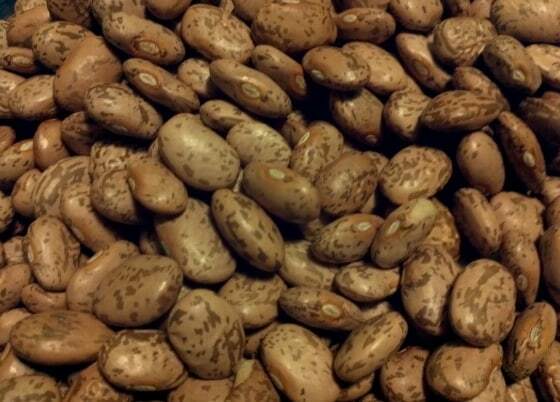 Some nutritional benefits of pinto beans include being rich in protein and fiber. 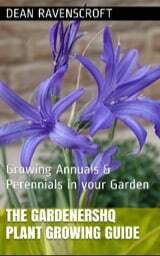 Growing them at home does not require one to be an expert gardener as they are very easy to plant and can be harvested once the seed pods are fully dried. Warm climates are suitable for growing this plant as warmer weather seasons promotes faster harvesting times. This annual plant grows best in an average, well-drained soil of pH 6.5 to 7.5. Pinto beans require full sunlight to grow well. They should be planted directly in the ground after any danger of a last frost has passed, and the temperature of the soil is at least 50°F (10°C). When seeds are planted too early poor germination can occur, as can rotting of the plant. Germination typically takes one or two weeks (quickest at 65 to 70°F; 18–23°C). An old dresser drawer or a typical flower box makes an ideal seed bed, simply fill it with garden soil. The soil should be at least four to five inches (10 – 13 cm) deep for the plant to have enough earth to take hold and grow into. When using outdoor topsoil, make sure that it has been warmed to at least 50°F (10°C) before the seeds are planted. Slightly dampen the soil and avoid drenching it with water as pinto beans are susceptible to rot before they can germinate if they are planted in wet soil. The seedbed should be located so as to have direct contact with afternoon sunlight. Also provide two to three inches (5 – 7.5 cm) of mulch between each row. This process will help retain even moisture in the seedbed and help to prevent weeds. Prepare the seeds by first putting them in a damp paper towel, then place the towel and beans into a small plastic bag. This should be kept in a dark, warm place until some of them begin to sprout. This process normally takes around five to seven days, this process can be accelerated by first soaking overnight in warm water before planting. Dig a narrow furrow that is around one to two inches (2.5 – 5 cm) deep then drop the beans into the furrow with four inches space between them. For a planter box that is 24 inches wide or less, one row of beans should be created in the center of the planter box. This spacing will help aerate the soil and promote better cultivation. Once the seeds are planted, sprinkle water lightly on the soil and leave the surface moist (do not use too much water, nor disturb the seeds). Once the pinto Bean plants reach four to six inches (10 – 15 cm) in height, place an ample amount of fertilizer or compost into the soil without disturbing the roots of the young plant. It is also possible to plant beans directly to the seedbed. Ensure the eye of the bean faces downwards and bury about one to two inches (2.5 – 5 cm) deep at the same spacing as above. Ensure that there are at least 24 inches (60 cm) between rows, and that good ventilation is possible. As the plants grow, the soil should be cultivated between rows only in areas where there are no sprouts or bean roots presents. The loosened soil can hinder the compacting of the soil and will prevent growth of weeds. Weeds that have grown should be pulled by hand, ensuring not to disturb the sprouts or growing roots. Pinto beans should be watered minimally, only when soil in a container or planter box has dried out. Avoid adding more water than the soil bed can accommodate. Water early in the morning and not late at night to help eliminate excess water. The plants should be well mulched, as this will help keep the soil evenly moist and reduce growth of weeds. The mulch will also prevent the pods from rotting. Pinto beans require a moderate dose of fertilizer, this should be given once plants start to flower. They are ready to be harvest when the pods are green, plump, and full. Stop watering the plant two weeks before harvesting, as this will cause pods to turn yellow and dry. Pinto beans mature in about 90 to 150 days, based on their variety. Adding pinto bean inoculant to the soil will increase the efficiency of Pinto bean nitrogen fixation, but is not compulsory, as the plant will develop its own mechanisms given time.